The photo was taken in the backyard of our 1920s bungalow, our home of 25 years, after seven weeks of trying to call attention to building code violations - and being repeatedly ignored and misled by Colorado Springs city officials. Besides being an invasion of privacy and an inappropriate building in a historic district, we discovered that building's setback was in violation, it was illegally oversized (as to maximum size on an ADU - almost 100 square feet over legal limit). Worse, we would discover, in Part III, that it violates Fire Access Codes and so is a danger to inhabitants, neighbors, firefighters and our properties. It's slated to be a vacation rental property. The open balcony, aside from invading privacy, also provides no barrier to noise. 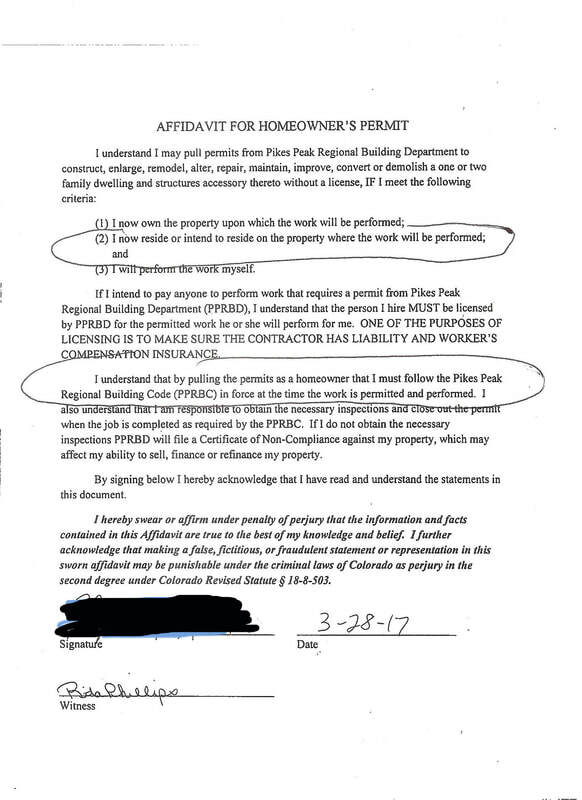 At the end of Part I, Mr. Peter Wysocki, the Director of our Colorado Springs Planning Department, had not admitted or addressed, in writing, the illegal size and setback issues with a building that had been constructed next door to our home of over 25 years. This building's violations had to be shown to him as such through our research and calculations as his office did not do that work. Below is the series of correspondence, minus the letters we sent to him on ethical considerations (covered on another page), and of our disappointment with our meeting with him on July 10, 2017. Through all that correspondence and the meeting, nothing was admitted by Wysocki, nothing was resolved. Our letters in that section challenge Wysocki's handling of this issue on an ethical basis. As is the norm, he does not respond to those charges, either. The correspondence below takes place in July through September 2017. I believe you will be shocked to discover how in September the City Planning Department attempted to resolve the illegal size issue by apparently manipulating the planning rules to fit two agendas: an agenda of covering up their mistakes, and an agenda of helping a builder who has blatantly violated building codes and submitted fraudulent paperwork on a building project. TWO WEEKS AND TWO LETTERS AFTER OUR July 10, 2017 MEETING WITH WYSOCKI - A RESPONSE! Thank you for your comments. As I have indicated to you, the City has “flagged” the building permit to hold the issuance a certificate of occupancy for the accessory dwelling unit (ADU) until the finished livable square footage of the ADU is properly resolved. I would like to again reiterate that the second story balcony is NOT in violation of City Code as the Code does not prohibit second story balconies or decks. Important Note: This will be the first time Mr. Wysocki uses the term "finished livable square footage of the ADU". This will come into play when we discover their approved "resolution" to this illegal structure. We respond with a letter on July 31 reiterating all the ways this building is nonconforming to code, to our historic neighborhood's aesthetic and history, and repeat that the only proper solution is to have this illegal building torn down. As is your habit, you have not addressed most of what was in our previous letter. You especially avoided answering any of the very important ethical issues we raised and your responsibility in regard to these issues. Instead, after three solid months of trying to get straight answers and action in regard to this illegal building, we get neither — only a three-sentence reply that everything’s still in limbo and that you are still taking no responsibility for issues that go beyond city codes. For starters: We understand the codes. We know that the balcony is “not in violation of City Code.” That is not the issue. The issue is the building is ethically nonconforming in ways that have been detailed in other correspondence, ad nauseam. This includes the intrusive, privacy-stealing balcony. This includes the four-foot setback from our property line. This includes the fact that this is a two-story building behind a one-story building in an established historic district. This includes the fact that this building is out of scale in regard to all other buildings on our street. This includes the fact that this is intended as a short-term rental property with a balcony overlooking private homeowners’ properties and it will lower the property values of our homes! We challenge you to find an A.D.U. like this anywhere in this city that impacts a residential property in a historic district like this one impacts ours. It does not exist. Your job is to not only ensure that codes are followed, but, as a leader, to go further, to “promote excellence of design and endeavor to conserve and preserve the integrity and heritage of the natural and built environment”. So far, you have not done this. You are setting precedence here, Mr. Wysocki. According to the American Planning Association’s Code of Ethics, which covers city planners’ “Overall Responsibility to the Public”, your ethical responsibility is to have “special concern for the long-range consequence of present actions”. So far you have shown no such concern. This is a structure which, if left standing as is, will be a black mark on this neighborhood’s aesthetic and on your career. ​The only way to get this situation “properly resolved” is to have this building torn down. It is illegal. It was approved through deception by the homeowner-builder. This structure, by all indications, and of which we have ample proof, was an attempt to defraud the City of Colorado Springs. Again, to remind you, when this issue of being oversized was brought up, in early May, THREE MONTHS AGO, both publicly (Colorado Springs Independent), and privately, we were met with stonewalling – both from you and the homeowner-builder. As homeowners affected by this building, we have had to find the “mistakes” of both the builder and the Planning Department. It is almost unbelievable what our family has had to go through to protect our property and our neighborhood, the hundreds of hours we have had to spend on this to try to get the City to do the right thing. To make allowances for this structure in any way, shape, or form is both a breach of ethics and a breach of the public trust. There is no response to the above letter. Over three more weeks pass. It's now been four months that we've been dealing with this, writing letter after letter to Wysocki and sending cc's to all members of our City Council. There has been zero response from anyone there, except one form letter from the mayor's office that they would respond, and then they never did. ​Almost one month ago we wrote you the letter, below, on the illegal property that has plagued our personal home and our historic neighborhood since late April 2017. This is a building that your office allowed to be built illegally, in blatant violation of code. A building whose plans were submitted, by all evidence, with a goal to deceive and defraud the City of Colorado Springs. We are the homeowners who had to discover, on our own and with zero help from your office, that this building was in violation. On July 25th you wrote back a brief note. You did not address any of the many ethical concerns we brought up in our letter of July 21 (below). Instead you only wrote that the City has "flagged" the building permit. You also wrote that the square footage could be "resolved". Resolution through aiding a builder who has built, through deception, an illegal building, is, of course, completely unacceptable. The only resolution is tearing down this building. Since July 25th we have heard . . . nothing. What we want to know today, what we demand to know, is simply this: When is the City of Colorado Springs, when are YOU, going to take action, real action, in regard to this illegal property? When are you going to do the right thing? This letter is also to show you we have not forgotten. We will not forget. We will not relent. We will not drop this matter until the matter is properly resolved and those who are responsible are held accountable. other issues that we have asked about, but makes sure, for the second time, to write "livable square footage". Thank you for your comments. We have been informed by Mr. ***** that he is working with an engineer to reduce the finished livable square footage of the accessory dwelling unit. He has stopped working on the structure pending submission of revised plans. 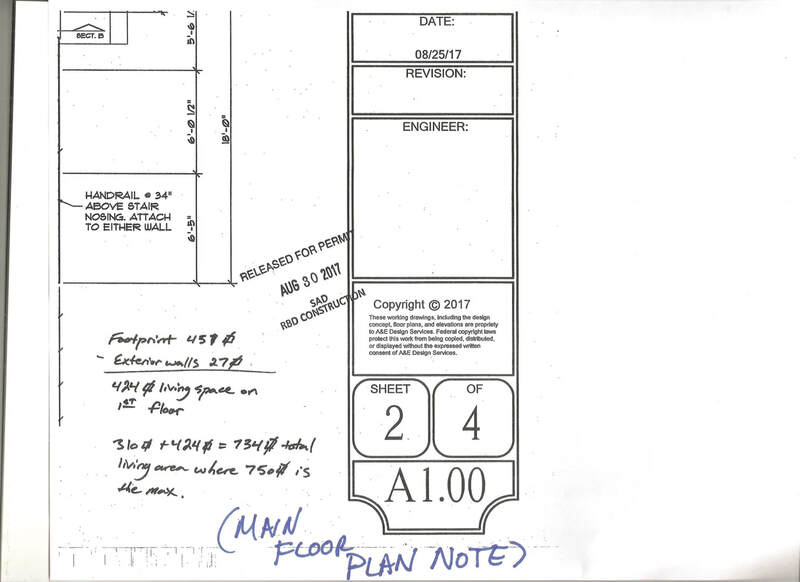 We finally learn how the revision of plans for this illegally-placed (in violation of code regarding setback), illegally-sized building was handled. We'll learn not through notification of Mr. Wysocki, or his Dept., but by purchasing access to Regional Building Department's website and, once again, doing the research ourselves. It is only a few days later, when we're able to really look closely at the plans, that we see how they have "reduced" the rest of the building. The only real reduction was the 18 square feet that brought the setback to code - the rest was a manipulation of numbers by deducting wall thickness and an interior staircase. At first, we think, "This has got to be a joke." Now they are manipulating the rules to "fix" problems? We respond in the letter below. This letter was also to inform them that the neighbor moved out in September, another violation of their agreement with City Planning. Again, we carbon copy all members of City Council and the media and we receive no response from anyone. We see that the ******s sent in a plan splice for their A.D.U. building to rectify their illegal size and illegal setback issues, and that this new plan was almost immediately approved. 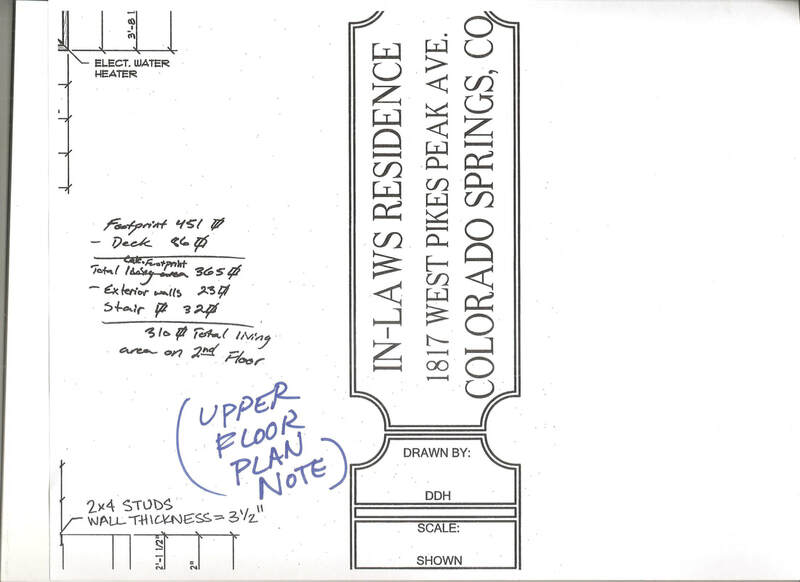 You and/or the PPRBD approved these new plans (attached), which are illegal (more to follow on that), even though we, as long-time (over 25 years) property owners of two adjacent properties, have spent four months publicly protesting this building and the many ways it degrades our unique historic Colorado Springs neighborhood and our personal property values, privacy, and quality of life. These four months have included a loss of work for us while we attended to this issue, a loss of peace of mind, and, especially, a loss in faith in all departments involved. It is clear by your office’s actions that there has been little concern in this matter regarding ethics, common sense historic preservation guidelines, or proper oversight of A.D.U. plans. At the beginning of September, the ******s moved from this address. We are not sure how their vacating the property affects this situation legally as an “Affadavit for Homeowner’s Permit” was signed that included the statement that they will “reside or intend to reside on the property where the work will be performed”. (Attached, Page 12, and below.) I hope you will look into this as Mrs. ***** signed this statement under a penalty of perjury that she would be on the property. This affidavit was also a promise, signed under the penalty of perjury, that they would follow the codes. They did not. Now it seems as if the rules have once more been broken and we are left with an ugly, out-of-scale, privacy-stealing building next door to our home. This, on one of the most beautiful streets in our historic Old Colorado City neighborhood. Adding insult to injuries, these new plans show an approved revision that is illegal and unacceptable (copy attached — see Page 17 — enlargements below). You may remember that their building, now at 835 square feet, was supposed to be reduced to satisfy the maximum size requirement of 750 square feet. Instead, in an astonishing and blatant example of “changing the rules to suit an agenda”, the ******s submitted a plan which reduced the size of their structure by only 18 square feet. This was achieved by taking off a mere 1.5 feet on the western end – the end that has an illegal setback from our property (and that your office did not catch). This means that they still are getting away with having a structure that is 67 square feet above the maximum allowed size. However, on this plan that was approved, an additional 32 square feet were deducted through the chicanery of subtracting the square footage of an interior staircase! And then, a final 50 square feet were deducted by subtracting the width of all the exterior walls! Our first thought when we discovered these manipulations was, “This must be a joke!” But it can’t be a joke, because it was approved. These deductions are bizarre and unprecedented (we could find no instances where this is accepted practice at any city’s Planning Department in the entire U.S.A.). If something like this could be manipulated and changed for the benefit of the ******s, we are sure that the citizens of Colorado Springs would all be interested to know that they have been overpaying for their property tax based on square footage calculated in the traditional manner. Perhaps someone should get to work immediately on all the refunds that will need to go out as property tax bills from years past are adjusted! We need to hear from you immediately that this kind of illegal work will not stand — literally and figuratively. We request that you finally do right by us and by all Colorado Springs citizens who count on you as City Planning Director to uphold the rules. This building must be removed. There must be consequences for those who willfully and repeatedly disregard and break those rules. Another engineer (we don't know his or her name) made some subtraction notes on the old plans and Voila! the building now magically fits code requirements in regard to size! Thank you for your comments. 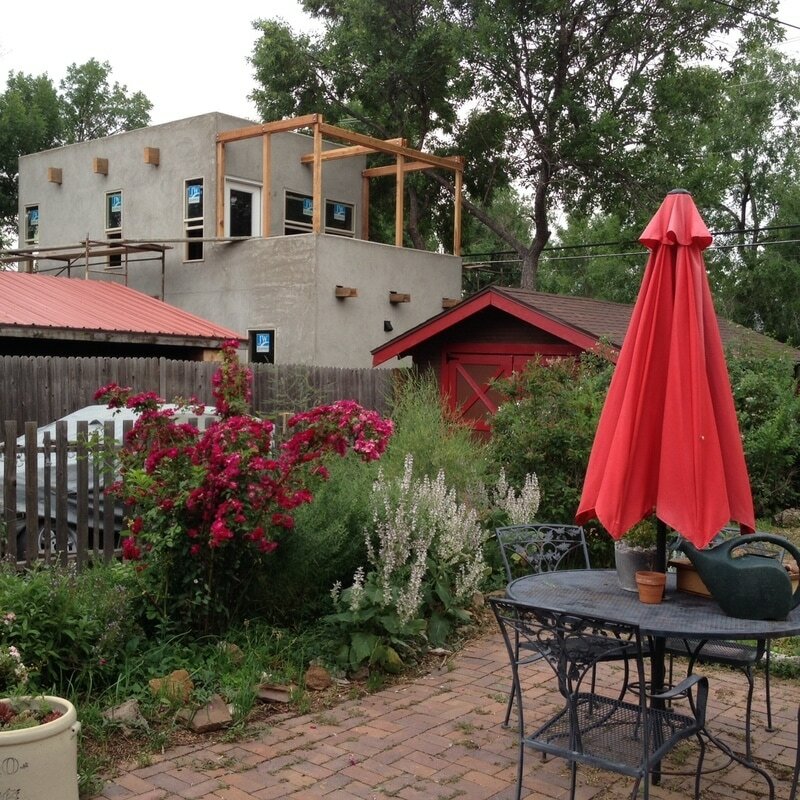 The ******s submitted plans to the Pikes Peak Regional Building Department to reduce the size of the accessory dwelling unit and move the exterior wall to increase the side-yard setback. It is not uncommon for revisions to be “spliced” into previously approved plans. City staff reviewed the revised plans. It is the City’s position that the revised plans meet City Code and complies with the “maximum footprint or finished living area” of 750 square feet. To further reiterate, there is no prohibition of two story accessory dwelling units or second story balconies/decks. I spoke with Mr. ****** this morning regarding the status of the homeowner permit. It is not required for the homeowner to live in the home during construction, but at a minimum, the owner must intend to reside in the property as the primary residence. Mr. ****** did state that he and his family have moved out for personal reasons. Regardless, he will be working to obtain a contractor to assume permit responsibility for the project. Once he obtains a contractor, our office will assist in transferring the permit to the contractor. We thanked Mr. Lovell for insight into what was going on with the neighbors as far as moving from the property when one of them signed an Affadavit that they would be on the property for this construction project. Andrew called Mr. Wysocki and received the following email. Mr. and Mrs. Knauf: I will be happy to meet with you to review the plans and illustrate how city staff calculated the finished livable square footage. Please let me know if you would like to meet and I will have my assistant schedule a meeting. Thank you. We're not sure why we would need you to explain how your staff calculated the area, in person, since from all appearances it looks as if you counseled the ******s to subtract the interior staircase and exterior wall thicknesses to bring this A.D.U. "to code". Once again, two deductions that are completely unprecedented as far as we know. However, we will agree to meet with you. Our calendar is full until after the first week in October - we will be happy to meet you again anytime after the 8th. In the meantime, we would like you to provide a written explanation of these calculations, and, if they exist, one or two examples on how these calculations have been used in other A.D.U.s. We would also like a response, in writing, on what this means to the citizens of Colorado Springs in regard to their property taxes. As of today's date, October 7, 2017, three more weeks have passed. There has been no written explanation of these calculations and no examples of how this these types of calculations have been used in other A.D.U.s. As usual, no written response from Peter Wysocki. During this time, the neighbors made their main house a rental and someone new has moved in. This is after they told everyone on the block all summer long that their intention was to stay in this neighborhood. They have never once contacted us to try to resolve this issue with us - in fact, they refused to speak with us and actively avoided any contact since the building began. They are apparently looking for a contractor to make the changes City Planning approved; nothing has been done yet. While most of our neighbors have chosen either to not get involved or to voice their support privately, we have received hate mail and bad treatment from two neighbors on the block, people we have known for many years and who we have been friendly with. This has been only one of the many hurtful aspects of going through this ordeal. Still, we are committed to standing strong in trying to protect our home and to revealing how our city's Planning Department conducts business. As we pointed out to these neighbors and others, we are not only doing this for ourselves, we are doing it to protect their property rights too.